She is a Program Associate at Akiba Uhaki Foundation (AUF) – the Human Rights and Social Justice Fund. Since January 2014, she has been charged with implementing and managing the Fund’s Community Grant Making processes. 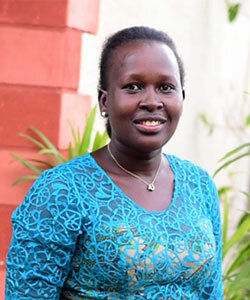 Prior to joining AUF, she served as an Assistant Country Coordinator with IGAD’S Conflict Early Warning and Early Response Mechanism (CEWARN) in Uganda where she was responsible for monitoring cross border pastoral conflicts in the Karamoja Cluster side of Uganda through research. From 2008 and 2010 Margaret served as Regional Program Officer with Uganda Change Agent Association; she worked with local communities to develop community-based responses to local problems through self-empowerment and advocacy with relevant stakeholders using the Self Reliant Participatory Development methodology. Margaret is a published writer and a member of Uganda Women Writers Association (FEMRITE). She is a Vice Chairperson of Nimwendo Afrika Forum Limited. Her core areas of interest and expertise include Grant Making, Human Rights and Social Justice, Project Planning and Management, Gender, Research and Peace building. Margaret holds a Bachelors Degree in Social Work and Social Administration and a certificate in Public Administration and Management from Makerere University Kampala; a Post Graduate Diploma in Project Planning and Management and is currently a Masters student in Management Studies (MMS) at the Uganda Management Institute (UMI).